One main focus of the NGSS is for students to communicate explanations describing the causes of phenomena they have investigated, accompanied with arguments that provide compelling reasons to accept the explanation. 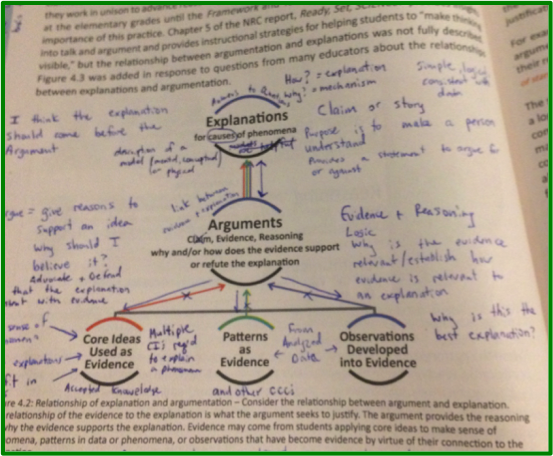 I have used the claim-evidence-reasoning (CER) scaffold for a couple of years now to support students in writing scientific arguments, and I feel like it has provided some good structure. This being said, it has also provided some challenges. The biggest challenge I have had with the CER approach is helping students see the difference between “evidence” and “reasoning”. The problem is that I have never felt these types of comments have been very helpful or clarifying to students. I started providing students with a bulleted list of questions or topics they must address in their reasoning component. This support has been helpful, but I am also worried it is a crutch since the quality of student responses inevitably goes down when those bullet lists of required items to address is not provided. Needless to say, I have had many questions about how to best support students in writing conclusion statements or explanations of phenomenon. The biggest problem is that I don’t think I have had a clear vision of what reasoning really is. I attended a professional development session on the NGSS earlier this week by Brett Moulding and Nicole Paulson based on the book they wrote with Rodger Bybee, A Vision and Plan for Science Teaching and Learning. 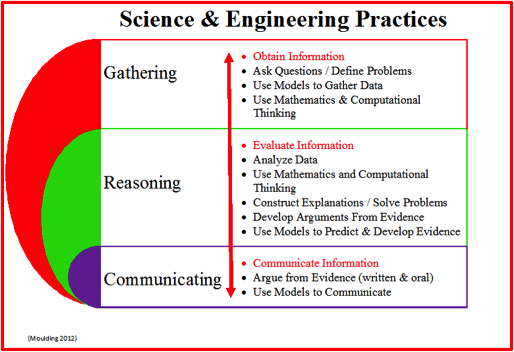 The authors propose the “gathering-reasoning-communicating” (GRC) structure as a simplified way of thinking about the Science and Engineering Practices. Reasoning is the keystone of the GRC structure and the primary thing we want science students to be doing. “Gathering” provides the raw materials for reasoning and “communicating” helps us know that reasoning has taken place. The GRC structure is summarized in the figure below. The GRC structure, along with the figure shown below from page 40 of the book by Moulding et al. that describes the relationship between explanations and arguments, got me thinking about the CER scaffold I have used and sparked some personal reflection that I think helped me obtain some clarity on what reasoning is. Although the CER scaffold provides necessary structure in helping students write evidence-based statements, I’m thinking it has actually confounded my understanding of the meaning of reasoning. The meaning of reasoning is “thinking about something in a logical, sensible way”. Validity means to be “factually sound”. Putting these definitions together, I define reasoning as “thinking that is grounded in facts”. Maybe one of the things that has been confusing about the CER scaffold to me is that the whole process is really reasoning, not just the reasoning component. When it comes to asking students to describe a phenomenon they have investigated, I think using the language of explanation and argument might be more helpful than the language of claim and reasoning. My thoughts regarding the term “explanation”: The purpose is to help the audience understand what the author believes to be the causes of a phenomenon. The explanation should describe how and why something happens and could be thought of as the story behind the phenomenon. There are lots of possible explanations people could come up with for any phenomenon. Whether those explanations are grounded in fact or evidence is another story. By definition, I believe an explanation can be made without evidence, although such an explanation would be weak and not very credible. Under the CER scaffold, the explanation would be analogous to the “claim”. My thoughts regarding the term “argument”: This is where the author advocates for and defends his or her explanation with evidence. The argument should explain how the author came to know the information presented in the explanation. An argument should provide reasons for a person to accept and believe the proposed explanation as the best explanation. Unlike an explanation, an argument cannot exist without evidence. A solid argument would establish the relevance, validity, and reliability of the evidence used. Anytime the author attempts to describe why the explanation makes sense, he or she is making an argument. The argument and explanation are interdependent and should be developed jointly. I view an argument as analogous to the “evidence” and “reasoning” components of the CER scaffold. Since evidence and reasoning go hand in hand, I don’t think it is helpful to separate them into separate components as is done with CER. I modified the figure from Moulding et al. 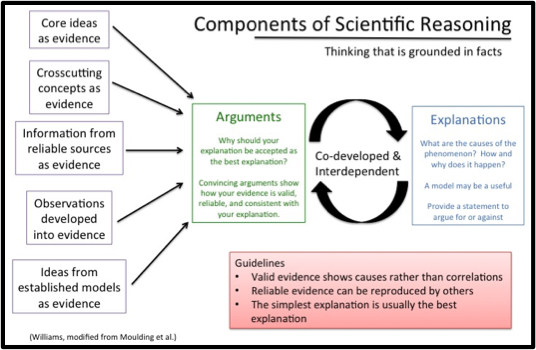 shown in Figure 2 above to summarize my thoughts on what I believe to be the components of reasoning. I envision using this figure with my students to support their communications about phenomena instead of continuing with the CER structure. I would love to hear any comments or feedback from the ChemEdX community regarding “reasoning”. Do you agree or disagree that the words explanation and argument may be more helpful than the words claim and reasoning? Is there anything you would modify in the figure I modified from Moulding et al.? What does the term “reasoning” mean to you? Editors' Note: Dustin Williams published another blog about NGSS, "Toward an Accessible Set of Chemistry Core Ideas to Help Students Make Sense of Phenomena".